Perkins always has owned BOSS plows and says, “I will never own any other brand!” His BOSS plow has gotten him through the toughest of winter storms. Three years ago, his area received approximately 18 inches of snow. Perkins says his 8’2” plow at the time battled the storm like it was just a dusting. Perkins likes the reliability BOSS provides as well as the no lift chain system and the easy attachment/ detachment- SmartHitch2 System. To prepare for big storms, Perkins checks to make sure his truck, plow, and spreader are washed and clean before he hits the road. He also cleans the inside of his truck as it becomes his home in the winter. Before all of his jobs, Perkins grabs a Mountain Dew to keep him energized! He then turns on his phone and listens to Slayer or his favorite plowing tune, Long Tall Sally by Little Richard. Perkins truly enjoys his job and the cold weather the winter brings! He loves the cold so much that he only wears shorts, shoes, and a sweatshirt when out on the job. He packs sweatpants, gloves, and a winter hat in a backpack just in case. In case of an emergency out on the job, Perkins knows he can count on John’s Garage in Glenview, IL to take care of him. “They have been there anytime I have needed new equipment or parts. It is dealers like him that keep BOSS king of the mountain!” Perkins said. Perkins advice for all snow removal contractors is to take your time! “Being in a hurry results in possible damage to equipment and property. Time is money in this business but safety comes first,” Perkins said. 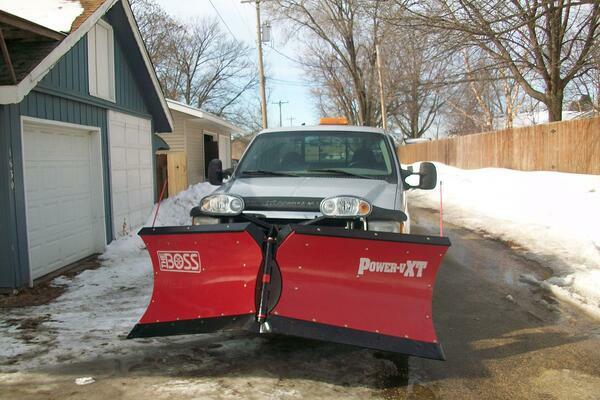 BOSS also values the safety of its employees, distributors, dealers, and snow removal contractors out on the road! Thank you to Jason Perkins for sharing his BOSS story and for being a dedicated BOSS owner! If you would like to be featured on our blog, click the link below and submit your information.